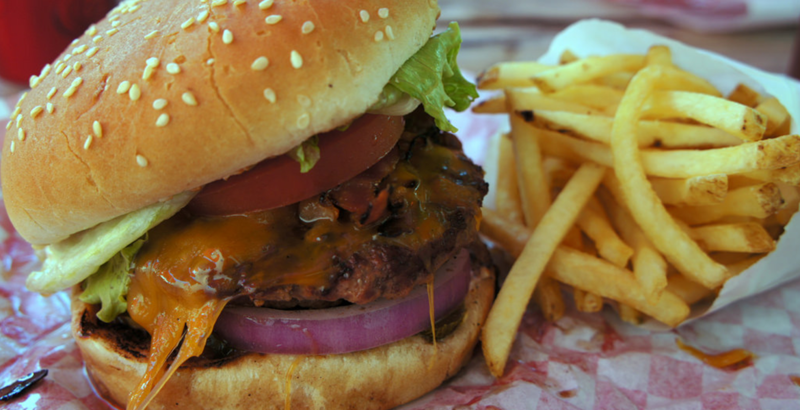 Angelo’s Burgers isn’t just renowned for its delicious burgers by North County and San Diego folks. Tourists visiting the area from all over the world come to chow down on the tasty burgers too. It’s a world famous burger, and the secret is in the sauce. There is no small size burger at Angelo’s! Whether you get the double everything Big Mouth Burger, the Monster Bacon Cheeseburger, or choose any of our other burger, you’ll bite into a juicy grilled patty on a fresh seeded bun. First, we start with an all-beef patty. Then we fire up the grill and get the temperature just right. You need a nice hot griddle for good burgers. We sear that burger on one side, and flip it just the one time. Our seeded buns which wrap themselves around all the goodness inside, so you can grab it and eat it. You might need two hands! Make sure you’ve got some napkins ready too, as you bite into a fresh grilled burger. If you’ve got a craving for something extra, you can add it. We’re talking Bacon, avocado, cheese, you name it, we’ll add it. It’s not just what goes IN the burger. You can get a side of our homemade onion rings, or zucchini fries for a really delicious meal. Grab a cold Coke or even a delicious milkshake like our Oreo Shake. If you need a caffeine kick, we’ve got a whole range of coffees. The secret to making customers happy is good food, and lots of it! That and the secret sauce on our world-famous burgers!